UK borrowers could be paying as much as two-and-a-half times the headline APR advertised by some personal loan lenders, leading to an estimated £194m extra being paid by borrowers each year, according to new analysis conducted by the Centre for Economics and Business Research (Cebr) on behalf of Shawbrook Bank. 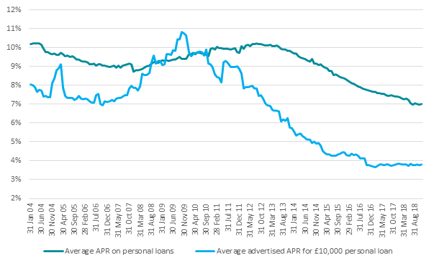 The analysis shows that the average representative APR advertised by UK lenders for a typical loan value of £9,000 ranges from just 2.8% to 5.5%, but the average APR paid by borrowers for a fixed rate personal loan is 7.0%, which is an increase of up to 150%. Although the gap between the interest rates being advertised by lenders and the interest rates being paid by consumers has widened significantly over the past 10 years, this difference has narrowed marginally over the past 12 months. The narrowing of the gap reflects the slowdown in consumer credit growth that has taken place in recent months. The latest figures from the Bank of England reveal in November 2018, the UK's annual rate of credit growth dropped to its slowest rate since March 2015. "The gap between consumers' expectation and reality when it comes to the cost of personal loans continues to be fuelled by the practice of 'teaser pricing'. The lack of transparency surrounding the loan application process is not only confusing to some consumers but in certain cases could be costing them money," said Paul Went, managing director, Consumer at Shawbrook Bank. "Collectively, households in the UK are paying millions of pounds more in loan servicing costs than initially expected. The disparity between representative APRs advertised by lenders and the APR actually paid by borrowers shows no sign of relenting and consumers should be wary of this when applying for a loan." Know your credit score – it is important to know what your credit score is before applying as this should determine which provider you approach and give you an indication of your likelihood of being accepted for a loan. Understand the process – spend some time researching what factors lenders take into consideration when reviewing your application, and what you need to get the best rate. This is important as rules require the advertised headline rate to reflect the rate received by at least 51% of applicants. Find the best rate for you – the top advertised rates aren't necessarily the best deal for you. Shop around to find which lender is likely to give you the best rate – don't presume this will be your bank. Don't forget a soft search – by using a price comparison website you can search for, and compare, the best rates currently on the market, helping you to make a more informed decision about the loan that is best for you. Borrow within your means – don't use advertised rates to decide on how much you can afford to borrow. Decide what your limit is and how much you can afford to repay each month before applying. Don't be tempted to borrow more than you can afford simply because you've been offered a higher amount. Pay down existing debt – it's also a good idea to pay off existing debt where possible before applying for a new loan. This is could increase your chances of being accepted and ensure you don't end up paying a higher APR.